Visualize your warehouse at work! Slot3D™ is packed with powerful analysis and design tools to quickly construct the optimum warehouse layout. Understand the feasibility of changes in warehouse workflow and the effective cost savings strategy for implementation. Give more attention to cost factors by studying alternative solutions in one model. Understand the preferred path to maximize the return on warehouse capital investment for DBOM (Design, Build, Own, and Maintain). Realize the benefit of analyses done during design to improve the warehouse performance rather than having to change an existing facility layout later. Incorporate standardized design concepts through tested best practices. quickly construct the optimum warehouse design. Experience the intuitive conceptual design workflow and benefit from the ability to make informed economic decisions. Simply enter general parameters about your storage equipment and watch as Slot3D effortlessly creates an intelligent and accurate 3D digital model of your warehouse. Designed for busy warehouse professionals that are simply looking for the “Net Result”. Easily apply the optimized results produced from the Warehouse Model to your operations. Get the full list of Slot3D Professional functionality and features in a convenient PDF. Slot3D™ is built specifically to help you design, visualize and optimize warehouse workflow by creating a digital model of your customer's warehouse operations. It combines unique AutoCAD® layout-specific functionality with powerful planning, visualization and analysis tools that help increase design and operational efficiency, when responding to owner requirements. Slot3D can re-optimize the storage strategy in your customer's existing operation to accommodate acquisitions and/or seasonal spikes. Show your customers the impact of potential changes before implementing. 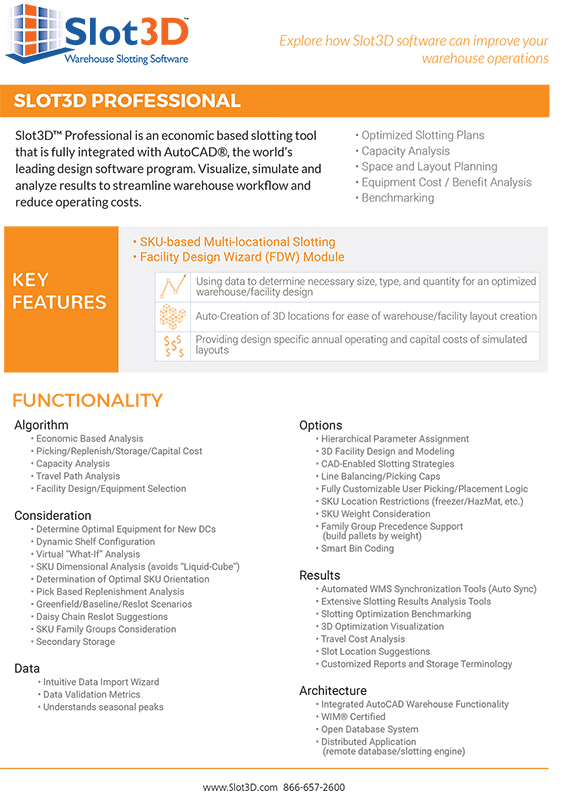 Slot3D can calculate the costs and benefits before the first change is made. Design and evaluate warehouse layouts that meet storage and distribution requirements and produce the best selection of type, size, and quantity of equipment. Visualize and simulate layouts digitally in 3D before making costly physical changes to warehouse operations. Evaluate functional aspects, explore designs in context, and efficiently communicate layout options to key stakeholders. Optimize SKU placement to minimize storage space, picking costs and equipment procurement expenses.